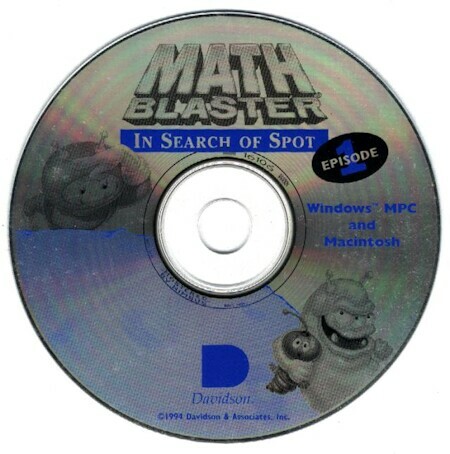 Math Blaster's story is a simple rescue mission, centering on the efforts of Blasternaut to retrieve Spot from the clutches of the malicious "Trash Alien," who, apparently, litters out of sheer spite. The garbage he leaves behind consists primarily of empty containers and bad food, though coil-springs, boots and fish skeletons are also present. In the opening scenes, Spot and Blasternaut are preparing for a journey aboard their rocket-like spaceship, only to find that the ship is not functional. Blasternaut, jumping to conclusions, sends Spot to repair a mechanism known as the "polytronic combustion regulator" and Spot reluctantly begins repairs, while Blasternaut goes below deck. As Spot works, the Trash Alien flies by, captures Spot and departs, leaving garbage everywhere. Blasternaut, upon discovering this, contacts his superior officer, Galactic Commander, and notifies her of the situation. Galactic Commander immediately identifies the criminal and sends Blasternaut on a mission of four objectives. 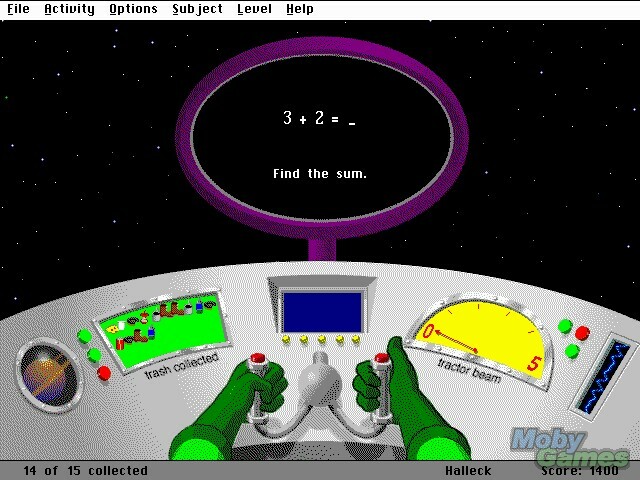 This leads to the game of "Trash Zapper," wherein the user, as Blasternaut, uses math to generate the "tractor beams" needed to collect the trash. For every problem answered, a tractor beam is added and, after five problems, a noneducational firing session begins, in which the user tries to collect as much of the trash as possible. Once the firing session ends, the user is presented with more math problems and the process repeats until all the garbage has been collected. The setting of this level can be changed to one where the trash constantly floats in front of the spacecraft, and the user has to quickly solve the equation in order to capture the trash before it disappears from the screen. The fuel tank is on the left, and on easier levels has 15 sections instead of 25. By clicking or double-clicking on the rectangles beneath Blasternaut, players instruct him where to go and press numbers and operators down. Blasternaut then goes down to the fuel chamber to recycle the trash. Here, the player completes equations, at which the machinery of the Number Recycler (a large structure used to create fuel) melts the garbage, freshens it to maximize energy and loads it into the fuel tanks. The player can adjust the numbers and symbols as needed. Finally, it is Blasternaut's task to enter the Trash Alien's flying saucer and rescue Spot. In order to do this, he must fly through one of four openings in the flying saucer, which contain the answer to a particular problem. He must choose the right answer and reach it before being shot by the Trash Alien's weapons or being struck by flying garbage. In addition, he has only a limited time before the problem changes. If he is successful, Spot is freed and the Trash Alien's craft is destroyed, though the Trash Alien escapes. There are six levels of difficulty, which adjust how hard the problems of the chosen subject are. If the user attempts to change subjects or leveling during the course of a mission, then the game will warn them that, if they do so, the mission will begin anew, which it will.